As a geologist, I don’t get too much into biology (except for dead things – fossils). But given my early career analyzing kidney stones, I’ve been fascinated by biomineralization. So I was interested to learn of the first discovery of aragonite eyes. Aragonite is the orthorhombic form of calcium carbonate, more familiar as calcite, the hexagonal (rhombohedral) type. Both are CaCO3 but their crystal structures are quite different. There is a rare less stable third form, vaterite, that crystallizes in the hexagonal dihexagonal dipyramidal crystal class and is sometimes found in gallstones. But back to eyes. The research linked above found that some chiton lenses consist of aragonite crystals. Acanthopleura granulate, the fuzzy chiton of the West Indies, is a primitive mollusk, nonetheless pretty successful in evolutionary terms: the chiton group got its start in Devonian time about 400,000,000 years ago. 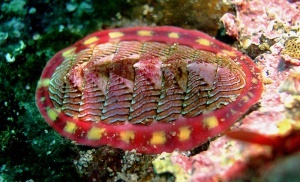 The West Indies version lives in intertidal zones – so maybe it should be no surprise that aragonite crystallography allows the chiton to focus light equally well through both water and air. Modern animal lenses are biochemical compounds—proteins—that have evolved transparency. But early in earth’s history, other critters, including trilobites, developed single crystals of calcite as optical lenses. This evolutionary development might have been an important factor in the Cambrian Explosion, the time about 530 million years ago when all the major phyla developed in a geologically very short time. In the Blink of an Eye, by Andrew Parker, explores this idea in depth. In the industrial world, aragonite sometimes finds uses in glass and cement making, but calcite, far more common, is generally used. Aragonite and calcite both make beautiful collectible mineral specimens. Chiton photo by Kirt L. Onthank, via Wikipedia under Creative Commons Attribution-Share Alike 3.0 Unported license.